There are 870 known species of Squat Lobsters in the world. Squat Lobsters are decapods crustaceans. They are not lobsters at all but are more closely related to hermit crabs and porcelain crabs. They can be found in the different oceans of the world. 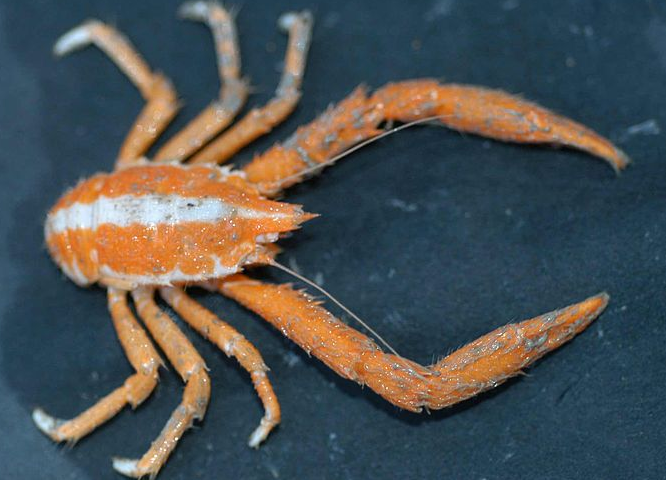 Here are some of the most colorful and peculiar species of Squat Lobsters. Elegant Squat Lobsters can be found in the Philippines and neighboring areas. This colorful marine animal is also commonly known as Feather Star Squat Lobster and Crinoid Squat Lobster. It is sometimes kept in marine aquariums. Munida quadrispina is a brightly-colored species of squat lobster. The specimen on the above picture was photographed at the Vancouver Aquarium in Canada. It belongs to the largest genus of squat lobster called Munida. The Blind Albino Crab on the picture above is taken from Jameos Del Agua, Lanzarote, Canary Islands. It is also known as the Blind Albino Cave Crab is native to the Canaryu Islands. This small, blind and pale squat lobster can be found in lava tubes formed by volcanic eruptions 3,000 years ago in the Jameos Del Agua cave. Galathea strigosa is the largest squat lobster in the northeast Atlantic. It is edible but not commercially fished. Its carapace can reach 5.3 cm and can attain a length of 9 cm. it is characterized by transverse blue stripes across the body. Munidopsis serricornis is a widely distributed squat lobster species that can be found in the Atlantic, Pacific and Indian Oceans. It grows up to a carapace length of 2 cm. Galathea intermedia is the smallest species of squat lobster in the North Sea. It only grows at a length of 1.8 cm. It can be found in the north-eastern Atlantic Ocean as far north as Troms, Norway south to Dakar and the Mediterranean Sea. This squat lobster’s whole body is red with a beige stripe along the back, onto the narrow rostrum and bears several "neon blue" spots on the front of the body. The Black Squat Lobster or Montagu's Plated Lobster is a squat lobster of Atlantic Ocean and Mediterranean Sea. It can grow up to 6.5 cm in length with a 3.2 cm carapace. This squat lobster is nocturnal and feed on small fish. Eumunida picta is abrightly-colored squat lobster species that inhabits reef on the western Atlantic Ocean from Massachusetts, USA down to Colombia in South America. Chirostylus ortmanni is a peculiar-looking squat lobster species with unusual body structure and extremely long legs relative to its body. It belongs to Chirostylus, a genus of squat lobster in the family Chirostylidae. This peculiar-looking squat lobster is more closely related to crabs and hermit crabs than true lobsters. It is often referred to as the “Furry Lobster” and is commonly known as Yeti Lobster or Yeti Crab. Its most striking feature is the quantity of silky blond setae that covers its claws and thoracic legs. The animal’s hairy pincers contain filamentous bacteria which the creature uses to detoxify poisonous minerals from the water emitted by the hydrothermal vents where it lives. This carnivore also feeds on bacteria and can be found in the Pacific Ocean. I just love the way you research and present such unique stuff about animals.